It's a beautiful spring day here in Ohio! The sun is out and it is not yet raining. So I thought I'd stop by and share this post before heading outside with the fam. For my Sunshine Stamps post this week, I decided to make a scrapbook page. I love the image Lenny Loader, and really wanted to showcase him on a page, and I couldn't help but thinking of these pictures from a couple years back of my son when Santa brought him his toolbench. I had a few scraps of the orange plaid/little terrors DP I have been saving, and they were perfect! Lenny is a perfect addition to this page! Great colors and your little guy is too cute! Awww, I love Christmas pictures, great layout! 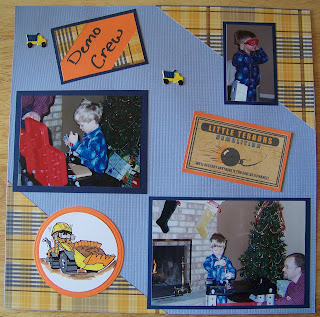 Awesome scrapbook layout! Love that you used Lenny Loader! Just precious! What a fun layout! This is absolutely too cute and adorable! I love your design and your embellishments rock! What a sweet little guy, this page turned out so cute! What a cute layout Colleen! I love the pics of your family with that image. Hugs! Love the corners.. I'm going to have to try that.